Standing Plaque supported by silver pins, with leadership themed writing in the form of a watermark. 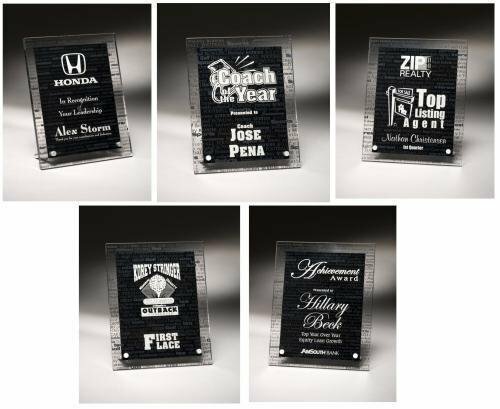 A New Concept in acrylic award presentation. Laser engraving to a frosted white color. Pure K9 premium optic crystal award with single green leaf attached in front of the circle. Perfect for award programs with green themes. Pure K9 premium optic crystal award with multiple facets. This award has awesome clarity and sparkles under the right lighting. The Legend has been a all time favorite. Classic styling ensures this award will never go out of fashion. Available in three sizes. Leucadia is part of the Chien J. Wang Collection designed by international designer Chien J. Wang. Chien uses double horizontal catwalks to partition the award. He then combines all the different pieces of crystal in a way that shows a third vertical through catwalk on the left side. This design is daring because it is very difficult to produce, but Chien is able to pull it off.